“It was like something out of a cheesy Hallmark movie, only it was real!” says a still somewhat stunned Patricia Wilson, executive director of Make-A-Wish Greater Bay Area, late in the documentary Batkid Begins. She describes looking out on the streets of San Francisco, seeing thousands of people gathered, clapping and dancing and just being excited to be there, all to help a little boy get a piece of his childhood back. And though helping ill and recovering children do that all the time, Patricia Wilson had no idea how big this was going to get. The outlines of the story of five-year-old Miles Scott are pretty familiar to most people. Now famous as Batkid, he’s really just a little boy whose infancy was marred by a battle with leukemia. When he qualified for Make-a-Wish, Miles said he wanted to be Batman, and Patricia Wilson figured that it could be done, maybe not simply, but it could be done. You may think you know the story, but in Dana Nachman’s inspired documentary, you get swept up in a narrative full of details that can’t be encapsulated in tweets and blogs, even though that’s part of how the whole thing snowballed. For an event that went wildly, wonderfully huge, Nachman (and co-writer and editor Kurt Kuenne) keep the focus on the personal. It is the story of a small boy and his parents, after all, living in a quiet town in Northern California. And then almost two billion people finding inspiration in that story. But along the way it’s also about Ej Johnston, the man tagged to play Batman. It’s about creativity, and adults learning to play, and remembering that whether one to one, or two to ten thousand, we’re all in this together. That is the narrative that plays out, starting with a comic book conceit as we get introduced to the Scotts. In the “first issue” of Batkid, we flip through animated pages that give the background of discovering little Miles had leukemia. The artwork gives us a little distance, but you can never forget the voices narrating are real people who went through unimaginable fear. 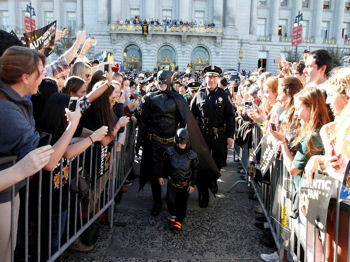 We know that it’s going to be a happy ending, though, because even if you weren’t one who followed it on Twitter or some other social media, Batkid’s day in San Francisco was hard to miss. But lots of children have had Make-A-Wish fulfill their superhero fantasies — what was it about this one that turned into a world-wide phenomenon? Batkid Begins: The Wish Heard Around The World can only offer speculation. Maybe it was something about the time — that as a culture, we’ve reached a tipping point where the power of social media had finally matured to get everything going. Maybe it was just the pure enthusiasm and adrenaline that drove all the masterminds of the event. Or maybe it’s something about Batman. Everyone from anonymous volunteers to Hollywood composer Hans Zimmer has a theory, and maybe they’re all right. Definitely in helping Miles be a hero for a day, they learned to be heroic themselves. Even if they played The Penguin. Batman is the hero that people like to imagine they could be, even without unlimited wealth and obsessive physical training. And on a subconscious level, people understand that despite the grim, more mature version of Batman that DC Comics often pushes, he is a symbol of protecting children. More so than any other well-known superhero (at least one marketed to children), he becomes the darkness to beat back the darkness. It’s very likely that it’s going to get remade as a narrative feature, with Julia Roberts playing Patricia. 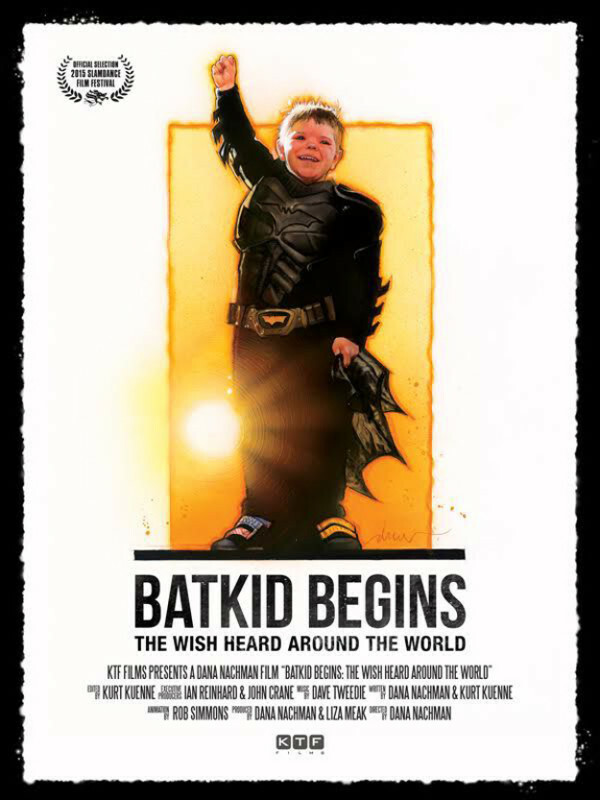 But it’s also likely (at least rumored at this point) that Batkid Begins will itself get a distribution deal, and really, this is the version that needs to be seen. You will find yourself absorbed in realistic characters and get caught up by their enthusiasm and struggles. Then you’ll remember they’re not characters, they’re people that did some good. We need to be reminded of that from time to time. We need to be inspired by a family who took their son’s tragedy then recovery to help others, to truly “pay it forward.” So why aren’t more days like this happening? Perhaps a movie like this will inspire more of them. Miles Scott may not be the hero that we deserve, but he is the hero that we need.